Why put off feeling good? Create lasting memories with loved ones and celebrate a better lifestyle as you take in the wellness benefits of a PDC Spa hot tub. 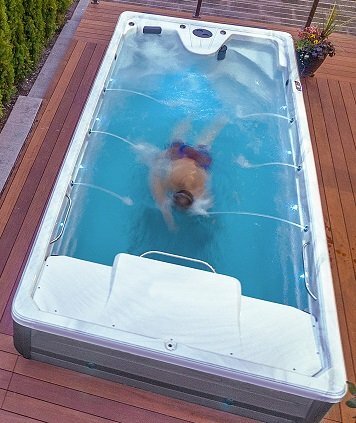 Relax in luxury and comfort as you absorb the healing powers of hydrotherapy in the privacy of your own home, any time you desire. Learn More. Discover a new way to exercise and improve your health with a PDC Swim or Fitness Spa. Convenient, affordable and stress-free to use, you’ll always have a good reason to spend time walking, jogging, swimming or just plain relaxing. Every visit is a rewarding experience as you burn more calories, boost endorphins and start to feel healthier overall; body and mind. At PDC Spas, our unique AquaForce™ pulley trainer keeps your upper body strong and toned, while our MotionMat™ makes for a more economical means to reaching your fitness goals as opposed to a bulky, expensive treadmill. Learn More.